it’s a funny time of year if you’re trying to eat seasonally in the uk. well, it is when it is when it comes to fruit – apart from stored apples and pears, almost the only locally grown choice you have is rhubarb. to be honest, this isn’t much of a hardship as it’s a favourite of mine but it’s not a cheap option so i was keen to find a way to use it in a more frugal way than just stewing it for adding to smoothies or eating with yoghurt. this, coupled with the approaching weekend and a desire for something lovely for breakfast, saw me decide to try nigella lawson’s rhubarb-crumble kuchen. 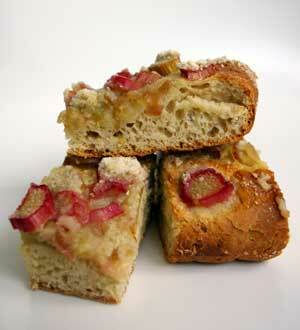 the kuchen is a spiced sweetened dough which is topped with pieces of rhubarb and sprinkled with a crumble mix. as promised by nigella, this is a lovely fruity bread to have with a cup of tea – just perfect for a slightly chilly weekend breakfast. and perfect too for the meeta’s monthly mingle which i have the pleasure of hosting this month and which has the theme spring fruit sensations! if you’re a food blogger, the 7th is the last day for you to post your recipe, just make sure you let me know about it. put 350g of the flour in a bowl with the salt, sugar and yeast. beat the eggs and add them, with the vanilla, lemon zest and nutmeg, to the lukewarm milk. stir the liquid ingredients into the dry ingredients to make a medium soft dough, being prepared to add more flour as necessary. i generally use 400g but advise you start off with the smaller amount, just add extra as needed. work in the soft butter (abby note: i needed to add extra flour at this stage as the butter made the dough quite sticky) and knead by hand for about 10 minutes. when the dough is ready it will appear smoother and springier – it suddenly seems to plump up to glossy life. cover with a tea towel and leave until it doubles (1-1¼ hours) or leave to rise slowly in a cold place (the fridge is fine) overnight if you want to have this for breakfast (let the dough come back to room temperature before using it). punch down and stretch to line a swiss-roll tin (c30cm x 20cm) which you have lined with greaseproof paper. if you are struggling to get it stretch to fill the tine, leave it to rest for 10 minutes mid-stretch. leave to prove for 15-20 minutes and preheat the oven to 200c. when the dough is ready, beat the egg and cream together, grate in some nutmeg and brush the mixture over the dough. to make the crumble topping, rub the cold diced butter into the flour until becomes like sand and then stir in the sugars with a fork. stir the rhubarb together with the sugar and allspice but don’t do this until the last minute as the sugar makes the rhubarb release its water. sprinkle the rhubarb-sugar mix over the egg-washed dough and then the crumble on top of that. put in the oven for 15 minutes then turn down to 180c and cook for a further 15-20 minutes, until the dough is swelling and golden at the edges and cooked within. remove from the oven and leave in the tin for 15 minutes. peel of the greaseproof paper, slice and eat, still warm.